I’ve been reading a lot lately . . . too much I think. Much of it is reaction to the Newtown tragedy. The proposed solutions range from strict gun control to arming everyone. As long as we keep the focus on guns we’re missing the root of the problem. True . . . guns don’t kill . . . our distorted cultural view of masculinity does. We teach our boys that being a “man” means having control at any cost . . . including violence. Arming more people is not the answer. Redefining masculinity and raising sensitive boys who understand that it’s okay to have and express all their emotions instead of denying and stuffing them so as not to appear “unmanly” would be a better course. Let’s face it our media and most world governments are controlled by large corporations that are making billions of dollars off our culture of violence . . . and spending billions to perpetuate it. It will take all of our cultural institutions, including churches, synagogues, mosques, temples, schools, colleges, and especially families working together. It begins with awareness. We have to pay attention to the “little things” we do every day that support a culture of violence. . . the thoughts we have . . . the words we speak . . . the shows we watch . . . the games we play . . . the products we buy . . . the examples we set. We need to shift our focus from changing everyone else to changing ourselves. I hereby resolve to pay attention and catch myself doing the “little things” I do every day that support and perpetuate a culture of violence. With self-awareness I can change it. I didn’t know my man card had been revoked. 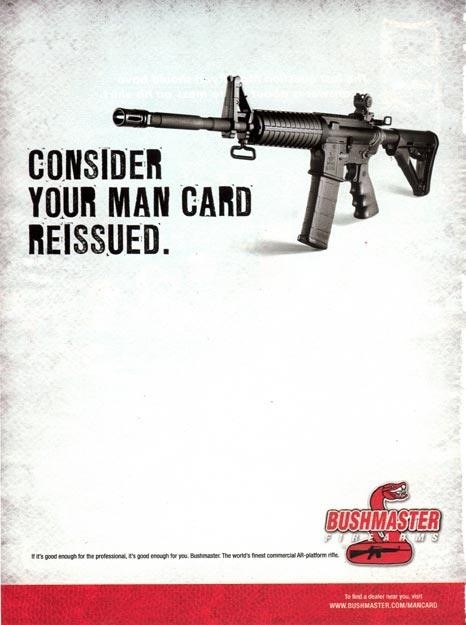 Gotta head to Walmart and pick up a Bushmaster so I can get it back.